Chronic pain is defined as pain that continues and/or grows worse over a long period of time. According to the National Institutes of Health, 50 percent of older adults who live on their own, and 75 to 85 percent of those in care facilities, suffer from chronic pain. This constant pain results in a variety of health issues, such as anxiety, depression, social isolation, decreased mobility, poor sleep quality, and other medical conditions that can result from these. Of course, one way to manage chronic pain is through the use of opioid pain relief medications, such as morphine, Vicodin, and OxyContin. Unfortunately, this common treatment has some issues in and of itself. 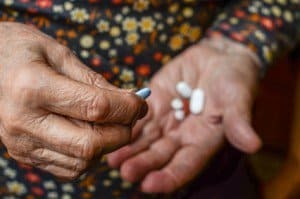 Earlier this year, the National Safety Council reported that seniors over, the age of 65, taking opioid pain medicines are 68 percent more likely to be hospitalized than those utilizing over the counter alternatives. They are also 87 percent more likely to die, be it from a fall as the result of their impairment, or gastrointestinal or respiratory side effects. If you have a loved one who has been prescribed opioid pain killers, you should be on the lookout for the following signs of substance abuse. If you believe your loved one is addicted to pain killers, seek assistance from a physician for a referral to an appropriate drug treatment program. Meanwhile, you can begin to educate yourself on safer methods which can be used to treat your loved one’s pain. In terms of medicine, over the counter drugs such as acetaminophen and non-steroidal anti-inflammatory medicines can help to manage pain. However, users are cautioned to not take more than what is stated in the directions, as overdosing can cause stomach, liver, and/or kidney damage. Additionally, depending on the type of pain, a doctor may be able to inject anesthetics in or around a nerve in order to block the pain signals. There are also several options that include no medicine usage. You should consult with your physician first to see if any of the following would be helpful to you before trying them. Assistive Devices– A cane, crutches, or a walker may assist with movement and minimize falls. Electrical Stimulation– A doctor can prescribe a device which will send mild electrical signals to the muscles to decrease pain. Heat– Applying a heating pad or hot water bottle to the painful areas for 20 to 30 minutes every two hours can help decrease pain and muscle spasms. Ice– Covering an ice pack with a towel and applying it for 15 to 20 minutes each hour can decrease pain and swelling. Rehabilitation– Your loved one can work with a physical therapist to learn exercises to decrease pain, and increase their strength and range of motion. They can work with an occupational therapist to learn new ways to go about their daily activities to minimize pain. Surgery– Depending on your loved one’s condition, age, and health, surgery to cut nerves or repair joints may be an option.